One of the central tenets of the report’s arguments concerns the ageing populations of advanced economies. 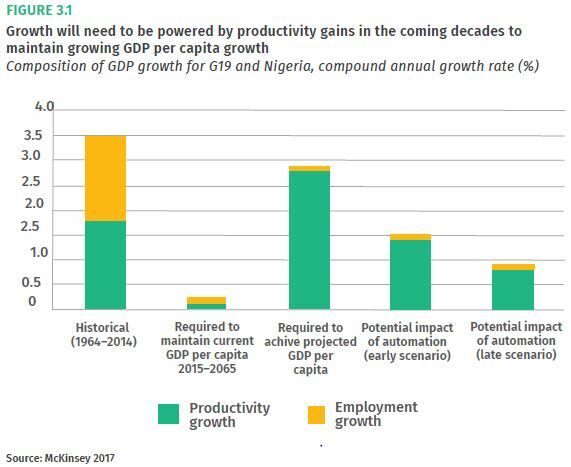 As the population of these economies increasingly age, employment will inevitably diminish as the lead protagonist of economic growth. Where there is increasing scope for growth, however, lies in the productivity gains that can be made from automation technologies. Rather than fearing the ‘rise of the robots’ as a dystopian jobless future, the report argues that automation should be considered a tool that can facilitate economic growth and, more importantly, lead to increasing wages and living standards for workers. This understanding of productivity and automation is currently at odds with the UK’s economic strategy regarding automation and AI technologies. It points out that in the UK ‘the sale of industrial robots actually fell in 2015 despite growing by 15 per cent worldwide, with fewer robots purchased in the UK than in France, Germany, Spain or Italy’ (32). It also points to a chronic lack of business investment in ICT technologies and machinery in the UK, concluding that ‘these are not signs of an economy on the cusp of a wave of automation’ (32). Based on the research presented in the report it is a failure of economic foresight and investment in AI technologies that threatens UK jobs in the long-term, rather than automation itself. It therefore simply isn’t sufficient for anyone, on the left or the right, to state something along the lines of “automation has always happened and therefore it is a non-issue”. Automation, it is true, is part of the incessant drive within capitalism to, amongst other things, improve productivity and therefore profits – but this is precisely why the debate over automation should be at the centre of a progressive political project. If there exists the possibility to improve productivity via the updating of current technologies (or ‘fixed capital’), then it is a political choice as to how the gains and benefits of said technologies become manifest. Ignoring the issue at best tacitly supports “business as usual”, and at worst leaves the design and effects of automation to (big) business. Indeed, referring to the falling share of income going to labour, the authors predict that ‘in the absence of policy intervention’ we’ll see further increases in inequalities of wealth, and therefore of power (24). 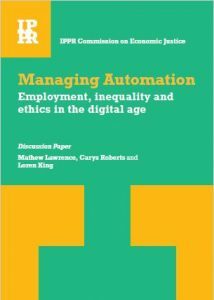 The report not only manages to confront the dystopian image of automation – by conveying a rationale for its inclusion in transforming work as opposed to eliminating it – it also manages to warn against the utopian idea that automation alone will necessary lead to greater social equality. In order for the whole of society to benefit from the potentially radical productivity hikes, there requires a political will to shape and implement automation technologies according to values of inclusivity and social equality. The concrete policy proposals outlined in the report provide a potential blueprint for how an economic strategy centered on productivity could adhere to the values stated above. For example, it recommends the establishment of a new body (“Productivity UK”) that would help all sectors in improving productivity performance in the workplace, ‘including through the more rapid adoption of digital and automation technologies’ (35). The report recommends that Productivity UK should be governed by a tripartite coalition consisting of government, business and trade unions; with an emphasis on increasing the voice workers are given in the implementation process. It also advocates for the apprenticeship levy to be widened to incorporate a ‘productivity and skills levy’, in order for firms to invest in training and skills utilization right across the workforce (35). The policies outlined in the report highlight how it is people and politics that can determine the future of work, rather than technology by itself. Understanding productivity as the potential driving force behind social prosperity and economic growth in the 21st century gives further credence to the idea that automation itself should not be unduly feared or uncritically embraced.  Instead, it should be understood within the political and economic context in which it emerges, entailing that we must a) critically examine our current economic situation in order to b) outline the potential political infrastructure that would be required to implement these technologies for the benefit of society. 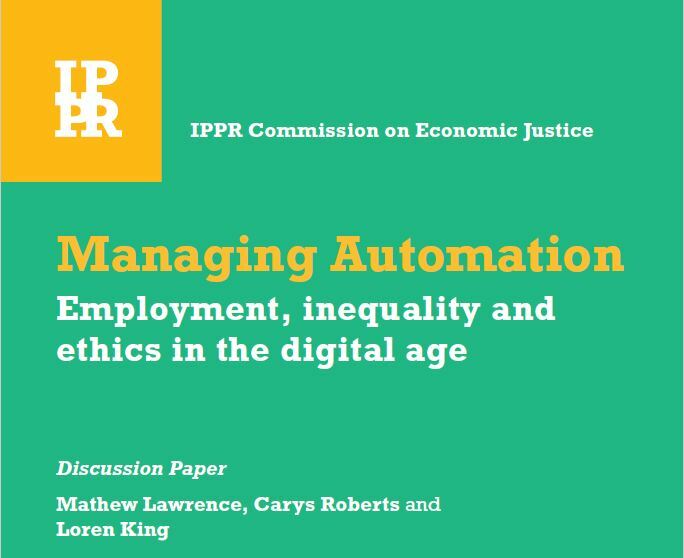 IPPR’s latest report manages to open up the discussion on technology to demonstrate how automation is a political choice that we can participate in, rather than an economic inevitability that will be enforced on us by the ‘logic of the market’. The authors’ emphasis on the more equal distribution of the benefits and profits afforded by a more automated economy leads them to conclude that a Citizen’s Wealth Fund should be established. In so doing they join economists such as Stewart Lansley and Guy Standing who have been calling for a ‘Social Wealth Fund’ which would be run along similar lines. A CWF would invest in productive assets on behalf of the public, in an effort to ‘transform national private and corporate wealth into public wealth’ (41). Crucially, therefore, a CWF is not simply about distributing funds to the public but is an institution owned by the public (and at arm’s length from the state). As with similar projects such as the Permanent Fund in Alaska, the annual income accrued by such a fund would be ‘returned to the public (its owners), either through individual transfers such as a universal capital dividend, or collectively via budget transfers or community investments of various kinds’ (42). Obviously, these different ways of distributing the income would work very differently in practice (receiving a no-strings-attached cash payment affords different individual freedoms and benefits than community-investment projects do), and the correct admixture of these would differ according to a given context. However, what is clear from the evidence of existing funds (such as Norway’s) is that their consistent expansion and increasing returns mean that they have great potential for economic justice in an age of radical transformation and crisis.